SmartOffice’s integration with Fidelity Clearing and Custody Solutions Wealthscape℠ helps you manage existing client relationships and onboard new clients faster and more efficiently than ever. Tap into your rich SmartOffice customer database to make the client onboarding process in Wealthscape℠ faster, more accurate and more cost-effective. From a SmartOffice contact or household record, you can securely transfer client data to Wealthscape℠, and then continue onboarding the client as you normally do. 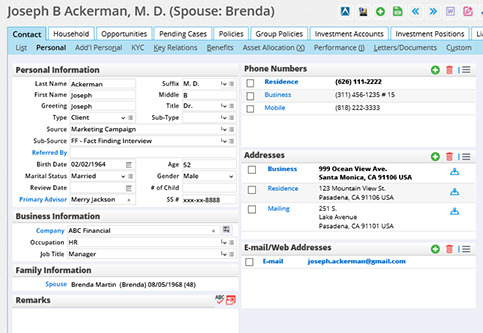 Stop wasting time with manual updates of your clients’ investment data in SmartOffice. With data import from Wealthscape℠, your SmartOffice client records stay up to date with the latest account and position data—automatically. With that data, you can create powerful, professional investment reports in the format of your choice. Navigate seamlessly between SmartOffice and Wealthscape℠ without juggling multiple logins. When you log in to one application, you’re automatically logged in to the other. If you’re viewing an investment account in SmartOffice, you can even jump directly to the corresponding account positions page in Wealthscape℠. Here’s a quick visual tour of the interaction between SmartOffice and Wealthscape℠. 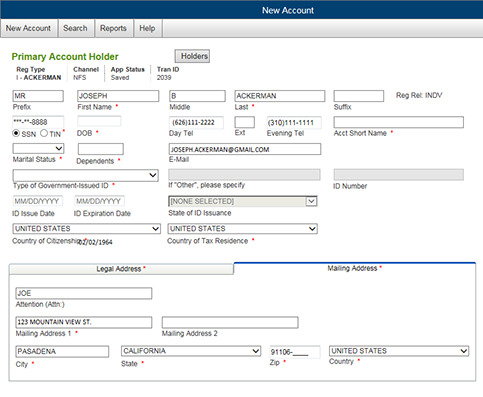 Select account holders in SmartOffice and securely transfer their data to the WealthscapeSM new-account form in seconds. Use the data automatically imported into SmartOffice from Wealthscape℠ to create quality reports for your clients. 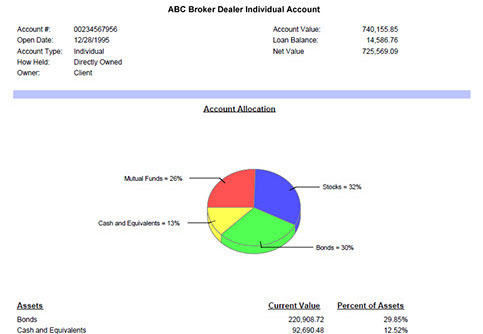 This Account Summary breaks down a client’s asset allocation by asset class and includes detailed account information. the competition with SmartOffice and Wealthscape℠. Copyright © 2017 Ebix Inc.